HomePosts Tagged "City of Mississauga"
A day after the Toronto Purchase agreement was reached in 1805, the Mississaugas of the Credit were asked to sell lands immediately west of the lands they had ceded the day before. 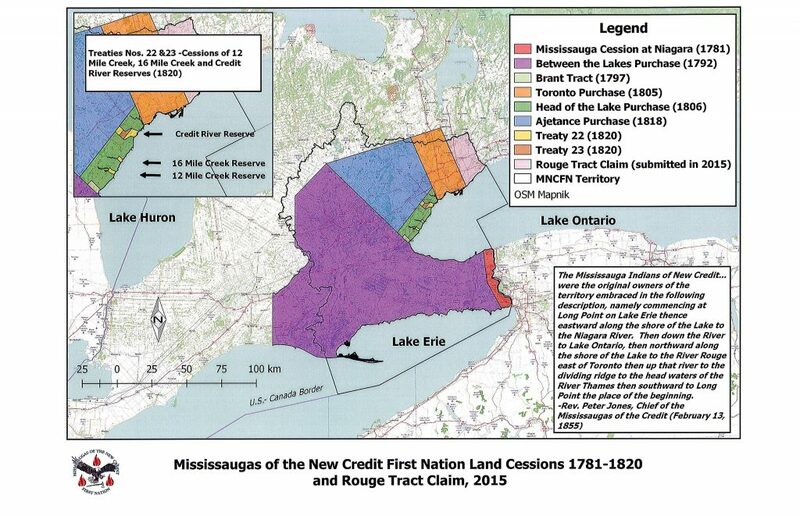 A provisional agreement was reached with the Crown on August 2, 1805, in which the Mississaugas ceded 70 784 acres of land bounded by the Toronto Purchase of 1787 in the east, the Brant Tract in the west, and a northern boundary that ran six miles back from the shoreline of Lake Ontario. In return for the land, the Mississaugas were to receive £1000 of trade goods and the sole right of fisheries at 12 and 16 Mile Creeks along with the possession of each creek’s flats. In addition, the Mississaugas also reserved the sole right of fishing at the Credit River and were to retain a 1 mile strip of land on each of its banks. On September 5, 1806, the signing of Treaty 14 confirmed the Head of the Lake Purchase between the Mississaugas of the Credit and the Crown. Modern cities found within the lands of the Head of the Lake Purchase include Oakville, Mississauga, and parts of Burlington. [vc_row][vc_column][eltdf_post_layout_six number_of_posts="9" column_number="3" category_id="206" author_id="0" sort="latest" thumb_image_size="custom_size" title_tag="h4" display_date="no" display_category="no"